I’m a little bit obsessed with focaccia. I think it was the first yeasted bread I ever tried to make. When I received a review copy of Edible Seattle The Cookbook, this was the first recipe that caught my eye. 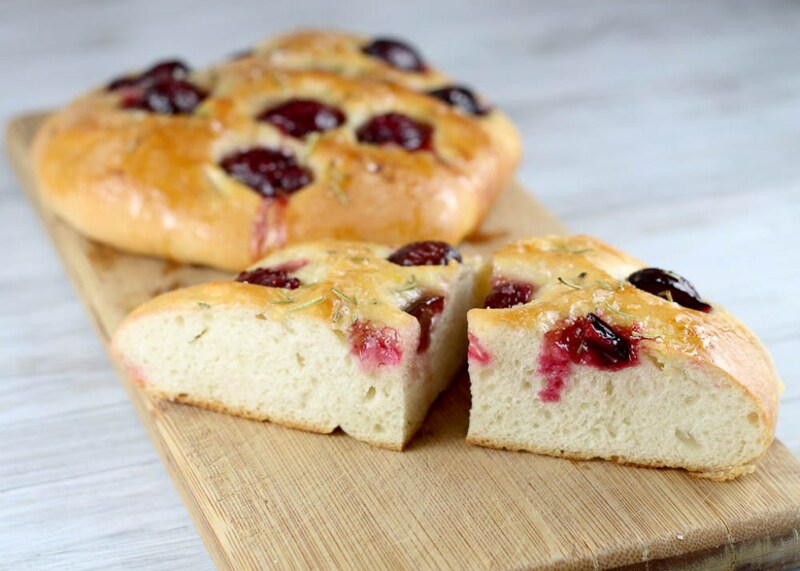 Every time I think I’ve found the perfect focaccia recipe, I come across a different version and immediately declare this new recipe as my favorite. 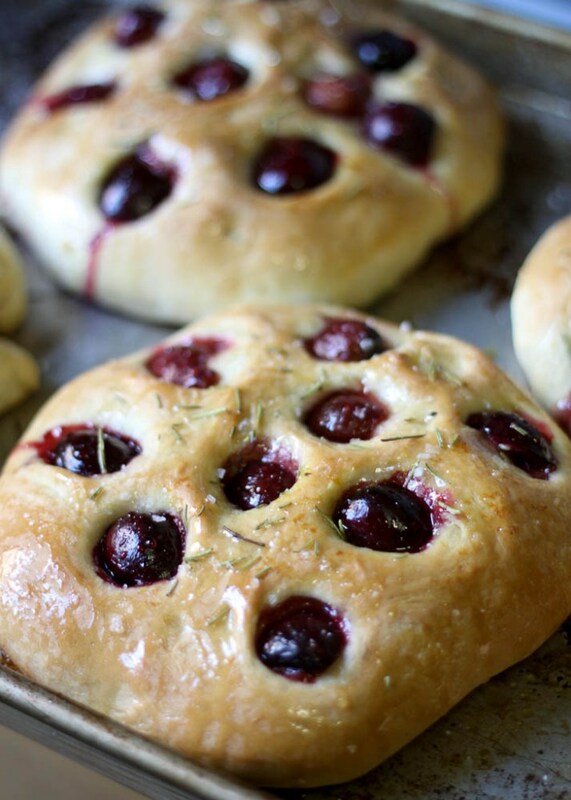 This is a dough rich with olive oil, sweet from the honey, and savory from the flaky sea salt and rosemary sprinkled on top. 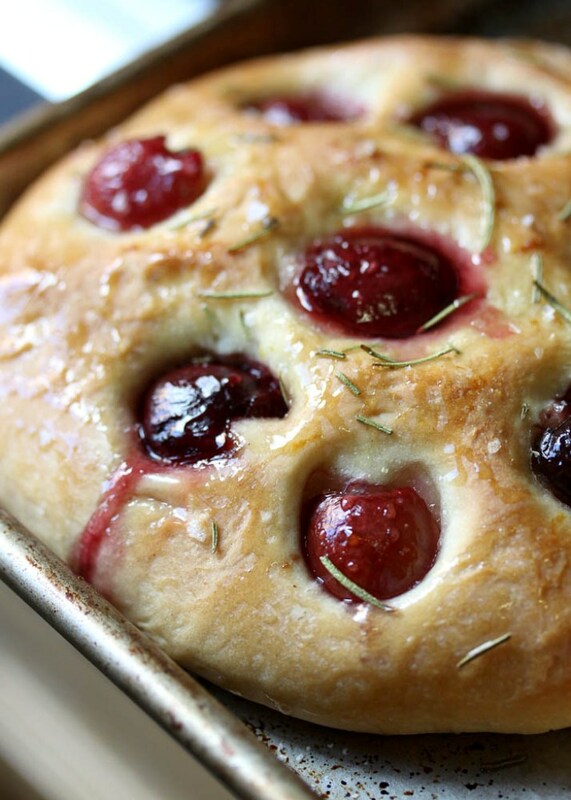 The cherry juices seep into the dough as it bakes, creating moist pockets of flavor in the dough. 1. Mix the yeast, sugar, and 1 ¼ cups warm water in the bowl of a stand mixer fitted with the whisk attachment. Give a quick stir and set aside for about 5 minutes to proof. 2. Stir in the olive oil and salt. Mix in the flour 1 cup at a time. When all the flour has been mixed in, switch to the dough hook if you have one or transfer the dough from the mixer bowl to a floured work surface and start kneading by hand. Mix or knead until the dough is shiny and firm (about 3 minutes in the mixer and 12 minutes by hand.) Then knead by hand, adding more flour if the dough is sticky, for another 5 minutes. 3. Lightly oil a large bowl and place the dough in the bowl, turning once to coat with the oil. Cover the bowl with plastic wrap or a damp towel, and set in a warm place to rise for at least 1 hour. The dough should approximately double in size. 4. Punch down the dough and divide into 4 pieces. On a floured work surface, flatten each piece and roll out to about a 4 inch round. Flip the dough over and press it lightly all over with your fingertips to make little dimples in it. Flip the dough and repeat. Do this 2 or 3 more times. Then place it on a baking sheet. 5. 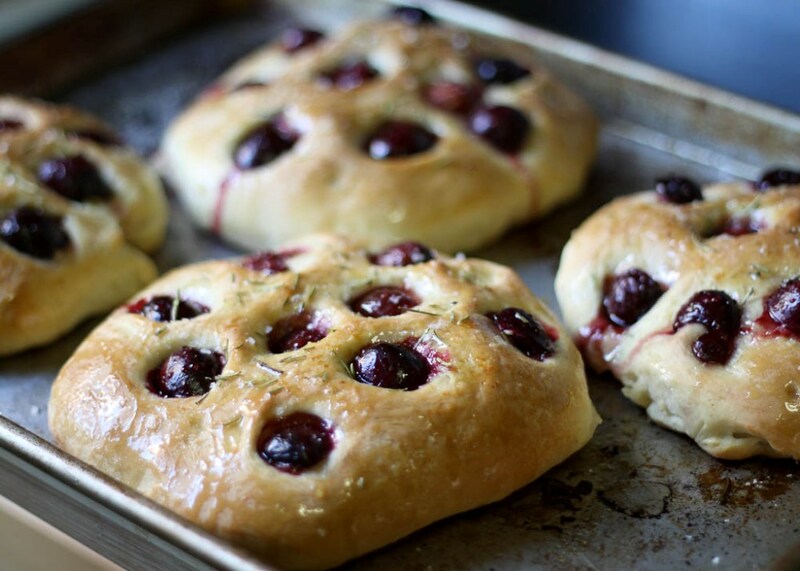 Lightly brush each round of dough with the olive oil; then cover them with the cherries, skin side up, gently pushing each cherry half into the dough a touch, being careful not to crush it. 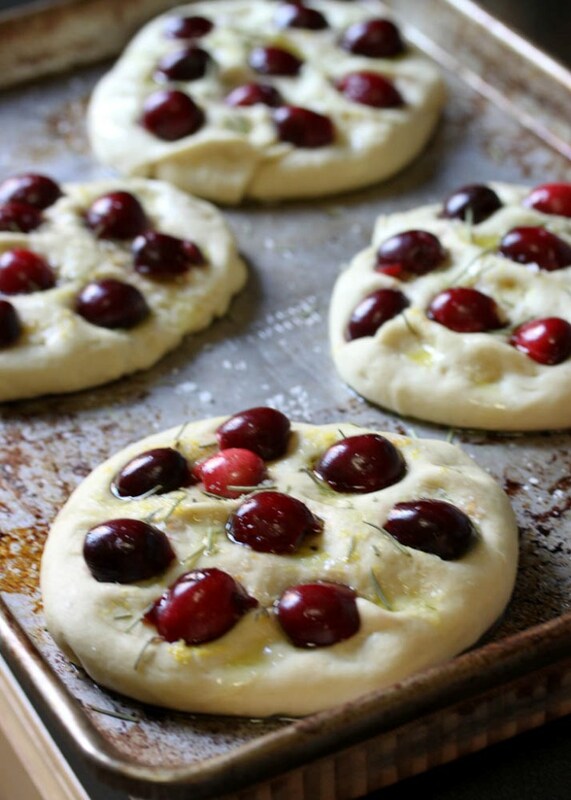 Sprinkle the dough with the sea salt, lemon zest, and rosemary. Cover with plastic again and let sit in a warm place for 20-30 minutes. 6. While the breads are having their final rise, preheat the oven to 400°F. Remove the plastic and bake on the center rack for 15 minutes. Remove from the oven, drizzle well with honey, and use a pastry brush to coat the crust edges. Return to the oven and bake until the crust is a light golden brown, about another 5 minutes. 7. Remove from the oven, drizzle with a bit more honey, and sprinkle on a little more salt. Let cool for about 10 minutes before slicing into wedges or strips. 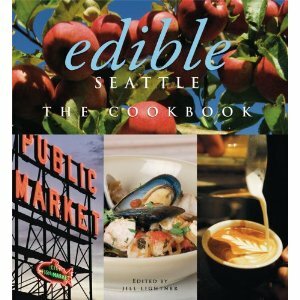 Disclosure: I requested a review copy of Edible Seattle The Cookbook. I was not compensated for this post. Opinions are my own. This was so delicious! 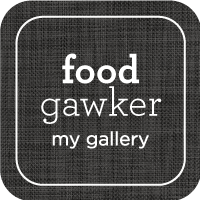 Would be amazing with sour cherries, too!